This animated 2D short is perfect for the KIDS FIRST! Film Festivals. In Spanish, with English sub-titles, it delivers a fun story with an important message about dishonesty, honesty and forgiveness. I love the line, "someone who steals loses his tranquility." The characters are adorable. The thief, a monkey, didn't intend to steal, He was attracted to the object and couldn't help himself. But, he's sorry, confesses and promises to never do it again. 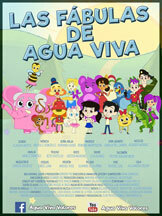 This is well produced with lovely animation, bright colors and a good message. We learn that it takes courage to confess, that we all make mistakes and that the most important thing is to learn from them. The music is catchy and reiterates the theme of the show at the end. I can see kids singing the song along with it, or humming it afterwards. I recommend this for ages 2 to 5 and give it 3.5 out of 5 stars. You should know that sometimes the sub-titles are a bit off, so be prepared for that.